Villa Knox is set just next to Royal Villas. The villa is only 20 – 25 min drive to the city of Bourgas or to Sunny Beach. This fantastic villa is situated a short drive from the sea in the village of Bryastovets, Bourgas, Black sea coast, Bulgaria. Villa Knox enjoys a very peaceful and secluded location with views onto sea and the city of Bourgas. The villa is featuring three double bedrooms: one master bedroom with en-suite toilet/shower, a second double bedroom and a twin bedroom with two single beds. There is a second shared WC/Shower room and a well sized living room with an open plan kitchen. All bedrooms are decorated in light colors with stylish furniture to provide more comfort and privacy. 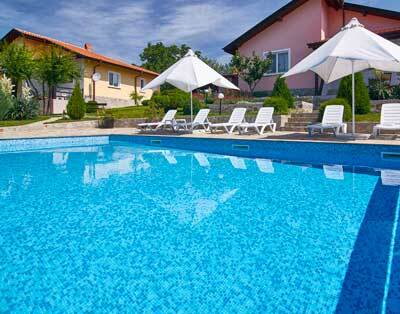 This villa is an ideal holiday residence in Bulgaria. Tastefully decorated and double glazed throughout with patio door to the front to provide lots of light floods into the villa. The fully equipped kitchen features fitted base and wall cupboards and breakfast bar with two high chairs. It is supplied with fridge, washing machine, microwave, toaster, kettle, full cutlery set, glasses and plates. The living room is very specious furnished with luxury contemporary corner sofa and a glass coffee table where you can relax and enjoy the outside view. The villa is detached and fully private, the garden has been carefully landscaped to provide a BBQ area with a 9 x 5 m swimming pool – only for the guest of Villa Knox. The garden has been mainly laid to lawn with beautiful seasoned flowers and shrubs. The BBQ is next to the pool so you can keep and eye on the children while you relax or cool off. Standard capacity of the villa is 6 people. Walking distance to couple of small local shops and bars. The villagers are lovely and friendly. In the village you will be able to experience the real Bulgaria in its charming and relaxing way. You are still very close to the sea by car and the big city of Bourgas and Bourgas airport. A lovely stay at the Villa Knox, it was our first Villa holiday and we were greeted by our host on arrival. A 20 minute drive from the airport. We hired a car which is a must and found the Villa really easy by using the coordinates that Ilya gave us for the Sat Nav. The Villa was very clean and tidy and had everything we needed, a lovely well kept pool and a undercover BBQ, which we used daily. The local shop is about a 5 minute walk, but only stocks the essentials (Bread, Milk etc). Situated in the mountains the Villa had a lovely breeze and it was really hot. We travelled to Sunny Beach which was 25 minutes away and Nessabar 20 minutes away. We also made regular trips to Lidls to stock up on food and beer. The nearest big supermarket was 25 minutes away in Burgas. We also found a lovely restaurant in Burgas call Incanto, very good food and friendly staff. We enjoyed the days down by the pool, the gardeners were very discreet when cleaning and maintaining the pool areas. The pool was great especially in the evening, where there is good lighting to go for a early evening dip. The only improvement I believe would make it more enjoyable stay, would be to have air conditioning in the Villa. The evenings in August are very hot, the fans are great to have but didnt always cool us down. A great stay and would definitely recommend it to others. Absolutely loved Villa Knox, the pool and garden were immaculate, the villa was really clean, 1st time in Bulgaria and we can’t wait to return, you do need a car for this place but the prices are very reasonable. We had lovely BBQ and a small trip to nessbar or sunny beach for a nice meal, sunny beach was one of the nicest beeches we’ve been to. The villa was very well appointed. The pool was cleaned daily. Villa modern and clean. Very quite, lovely evening listening to the dogs, frogs and crickets. You do need a car, Borgass short distance away. Good shopping centres. If you want travel further a field Sozopol is beautiful to visit, about 1 hour. Hosts both very lovely people and friendly. Always helpful, thank you. The village itself is small and quiet, which we loved. Bulgaria is cheap and a hidden gem. Would definitely return, had a wonderful time. Отдыхали в июле в этом уютном доме с красивейшим садом. Сначало немного испугало что нет кондиционера,но после первой ночи поняли что он совершенно не нужен,по вечерам свежий воздух спускается с холмов и в доме очень свежо. Дом находится в очень удобной локации в небольшой деревушке,где тихо и спокойно.До Бургаса 15 км,где есть и рынок и большие магазины и пляж. Большой бассейн где дети проводили много времени.Очень чисто и аккуратно,есть интернет,стиральная машина.Что ещё порадовало,так это кровати с очень удобными матрасами,все спали как дети,а дети спали как младенцы))Хозяева живут не подалеку,сад и бассейн убирается каждый день. И конечно же красивый вид на залив и Бургас.Мы провели очень замечательный отдых,и обязательно вернёмся!!! We stayed in July in this lovely house with a beautiful garden. First, a bit scared that there is no air conditioning, but after the first night we realized that there is no need for this, in the fresh evening air coming down from the hills and the house is very fresh. The house is located in a very convenient location in a small village, where it is peace and quiet. To Bourgas 15 km, where there are market and big shops and the beach. Large swimming pool where children spent a lot of time. Very clean and tidy, there is internet, washing machine. What is more pleasing, thebeds have very comfortable mattresses, we all slept like children, and the children slept like babies)) The hosts live close by, garden and swimming pool is cleaned every day. And of course, the beautiful view of the bay and Burgas. We had a very wonderful stay and will definitely return !!! Beautifully kept house and gardens, secure and safe. Directions to house were great, we had a Sat Nav which really helped as road signs hopeless! Also looked on google maps before we left to view the route. We were worried about the drive and the state of the roads, but it was all ok. Surrounding area to house is run down with very little to do so the car was essential. We were met at the house Ilya who was wonderful throughout our stay. The gardens and pool were discretely cared for on a daily basis and kept immaculately. The house was very clean, the beds very comfortable and clean linen provided mid two week break. Wifi connection great (especially for our children). DVD player great for chilled out time. Temperature during August was 34-37 and the pool cooled us down. Deposit of 300LEV paid on arrival (we had a few breakages that Ilya sorted with humour) and returned the remainder of our deposit on departure. I was also ill during the visit and Ilya was again very helpful. We had a really lovely two week break. Would recommend Old Nessebar (note AUG 15th is a festival each year, worth it, live music, laser show and fireworks in the eve) but don’t bother with Sunny Beach, it was an awful place! We ate several nights at the bar on the corner of the traffic lights in Alehoy, lovely lady and cheap food (all 4 ate for under £20). Also we used Carrefour (not French run, not good!) once and Lidl the rest of the time. Also went to Nessebar Aqua Paradise £15 each for all day great fun. The house has everything one can need or desire; it was very clean, as were the swimming pool and the garden; sunchairs und umbrellas, tables and chairs for breakfast, dinner or lunch in the sun or in the shadow, everything was present to meet any desire; the house was easy to find and to reach; we would definitely recommend the house to friends. We spent one full week in the villa Knox in June 2015 and it has been a really fantastic experience! First, the house is so very cozy, comfortable and light. There is everything you might need for a no-problem stay thousands km away from home: kitchen utensils, modern equipment, bedding, barbecue etc. Secondly, the swimming pool is a real pearl of this place! big, beautiful, always clean, with toys for children, quite warm even at the very beginning of June. Third – maybe the most important -great hosts Ilya and Dochka! They made everything to make us feel relaxed and comfortable: met us personally in the airport, perfect communication before and during vacations, responded to any request immediately, gave lift to Burgas supermarket, made so wonderful photos of our family:) thank you so very much!! I would highly recommend this place to anyone who is looking for a peaceful relaxing family vacation away from hustle and noise of tourist resort and still so close to the sea, which sight you can enjoy standing on the porch of the house. Right from the start of our holiday our host was very helpful. He was very friendly and spoke very good English which we appreciated. He met us at the airport at 4am to collect our daughter and son in law and waited around for myself and my wife to collect our hire car enabling us to follow him to Villa Knox. The photo’s on the website do not do Villa Knox justice, it was very clean and well equipped with all the necessary things required and they were of a very high standard. The furnishings were well above the usual villa rental standard, in fact we wanted to put the settee in our bags to take home. The beds were extremely comfortable and plenty of spare pillows/covers were available. The pool was amazing, it was bigger than we expected and very clean and well maintained. The hosts showed us around the other villas and were very friendly and gave us helpful advice on the local area and surrounding places of interest. There was also a very informative brochure giving information about local markets and shops with maps to help us get there. Overall we had a very enjoyable stay at Villa Knox and have rated it as excellent. Thank you for a holiday we wont forget, we hope you liked the rose bush we bought for you to plant in your beautiful garden. We had a great holiday, thank you. The villa was great – nice and clean, everything there that we needed. It was well looked after whilst we were there. Thank you to all your family, they made us feel very welcome and were willing to help us out when needed. We stayed at Villa Knox for two weeks in August 2013. The villa is exactly like on the pictures, well maintained, fully equipped and nicely furnished. In our case, three large bedrooms easily accommodated two families with children. The big attraction, especially for the children, is a swimming pool for the exclusive use of the guests of the villa. The house, the garden and the pool were very clean and well maintained by a discreet service. The villa is located away from the crowded and noisy seaside resorts, so this is perfect for those looking for a relaxing break. It is about 20 minutes drive to get to the sea. It is also a great base for exploring the many sights in Bulgaria (eg Dolphinarium in Varna). The management was very kind and helpful. We are very pleased with this holiday and hope to go back again to this place. Spędziliśmy w Villi Knox dwa tygodnie w sierpniu 2013r. Villa jest dokładnie taka jak na zdjęciach, doskonale utrzymana, w pełni wyposażona, ładnie umeblowana. W naszym wypadku 3 duże sypialnie pomieściły swobodnie dwie rodziny z dziećmi. Dużą atrakcją, w szczególności dla dzieci, był basen przeznaczony do wyłącznego użytku gości Villi. Zarówno dom jaki i ogród z basenem były bardzo czyste i zadbane dzięki stałej lecz dyskretnej obsłudze. Villa położona jest z dala od zatłoczonych i hałaśliwych kurortów nadmorskich, więc jest to miejsce idealne dla tych, którzy szukają odpoczynku. A dysponując samochodem wystarczy ok. 20 min. aby znaleźć się nad morzem. Jest to też doskonała baza wypadowa do zwiedzania licznych atrakcji w Bułgarii (np. delfinarium w Varnie). Gospodarze byli bardzo życzliwie nastawieni, uprzejmi, pomocni. Z wakacji byliśmy bardzo zadowoleni i mamy nadzieję jeszcze wrócić w to miejsce. We stayed at Villa Knox in May / June ’13. The villa was as described on the website – fully equipped for the stay, clean and spacious. The swimming pool was cleaned everyday even when it wasn’t used. The staff was really nice and provided everything we asked for. Nothing was too much trouble. The village is very peaceful and the evenings next to the fireplace were serene and beautiful. We enjoyed regular walks before bed. The villa is very close to Burgas and Pomorie so we could drive there for meals and shopping. The big supermarkets have everything you need. We have a baby so we brought lots of stuff from the UK but soon found out that wasn’t necessary. Great place if you enjoy very quiet holidays and you want to stay away from the crowd. Bryastovets is a nice, little village near Burgas, which is a major city in Bulgaria. It is both, a good basecamp for exploring Bulgaria and a private village which allows you a restful and cosy stay apart form the big tourist centres. We stayed at Villa Knox for three wonderful weeks. The compound is well maintained by the caretaker`s family. Therefore you have always people around, so it is not entirely private, but it’s not annoying at all. They stay in the background and are very friendly. If you need help or advice you can just ask and will find that they know interesting and helpful inside information. All in all it was very quiet and very recreational. Also the locals might share some of their home-grown vegetables with you, which taste very well actually. Furthemore one can go to Burgas and other interesting cities for example Nessebar, which is part of the UNESCO Word Heritage program, very quickly. You need a (reantal) car though, because there are no other means of transportation in the village. All in all it is highly recommendable and we are considering to come back. Bryastovets ist ein nettes, kleines Dörfchen in der Nähe von Burgas, welche wiederum eine große Stadt in Bulgarien ist. Es ist sowohl ein optimaler Ort um von dort Bulgarien, die Landschaft und die Kultur zu entdecken als auch ein privater, gemütlicher Ort, an welchem man sich gut erholen kann, besonders weil es weit ab von den Touristen-Zentern liegt. Wir blieben in der Villa Knox für drei wundervolle Wochen. Die Anlage wird von der Famile des Veraalters gut in Stand gehalten. Deswegen sind zwar oft Menschen im Garten, was aber nicht weiter stört, da sie sich bemühen im Hintergrunde zu bleiben. Wenn man Hilfe oder einen Ratschlag benötigt, so braucht man nur zu fragen und wird feststellen, dass sie über interessante Gehimtipps verfügen. Alles in allem war es sehr ruhig und erholsam. Des Weiteren versorgen die Einheimischen einen manchmal mit Früchten, bzw. Gemüse, welche sehr gut schmecken. Auch kann man leicht nach Burgas und zu anderen, interessanten Städten reisen, zum Beispiel nach Nessebar, welche Teil des Weltkulturerbes ist. Man sollte sich allerdings ein Auto mieten, sofern man mit dem Flugzeug angereist ist, da sich in dem Örtchen keine anderen Transportmittel befinden. Abschließend kann man konstatieren, dass die Villa Knox sehr zu empfehlen ist und wir vermutlich irgendwann noch einmal dort Urlaub machen werden. Absolutely fantastic time in Bulgaria. From the welcome to our departure we were very well looked after. The villa is large, spacious and immaculate. The pool was great for swimming and the surrounding gardens beautiful. We were close enough to the coast to explore the beaches and towns. Most of all it was peaceful with great views and wonderful weather! Perfect Holiday , thank you everyone! We stayed at Villa Knox for 2 weeks ths year in August (2011). The villa itself was as described. That is it was beautiful, clean and had everything we needed. The owners were very helpful and informative. The village itself was amazing – 2 great taverns – and a slice of rural Bulgaria. It was very peaceful and what made it really special was our neighours. The neighbours opposite kept us supplied with fruit and veg for 2 weeks, and refused payments. The neighbour behind us kept us supplied with honey’ We felt that we had a true experience of Bulgaria – not one that involved Sunny Beach! We had a hire car (essential) so we were able to explore at our will. Bulgaria is beautiful country. Lovely, helpful people. We will go again and again. The owners of the villa were brilliant! Please go if you want a real taste of Bulgaria.